There are many types of foundation, and many types of foundation brush. Depending on whether you are using a powder, mineral, compact, liquid or cream foundation, you may want to use a paddle brush, a buffing brush, a stippling brush, a pointed/round/flat-top brush... Even liquid foundations can vary in terms of consistency; thinner, thicker, creamier, water-based, silicon-based... and a particular type of brush that might work well for a creamier liquid foundation might not work as well for a thinner formulation. It's a question of trial-and-error! I've listed my top brushes and what I use them for. Estée Lauder flat foundation brush. The picture shows the older model (which is the one I have), which had a plastic handle; the newer ones have a wooden handle. This was the first foundation brush I ever used or purchased. It has synthetic bristles. This one was the second I purchased, after using the first one for about two years, the bristles all fell out - however the second one is on the go for many years now. It's not a bad foundation brush, but there are better - you have to work a little bit with it to make sure you avoid brush marks and streaking. The reason I include it here is because it was my first foundation brush ever. MAC 190 Foundation Brush and MAC 191 Square Foundation Brush. The 190 is probably the best "standard" flat/paddle brushes that I own. For me, it has the right amount of fibres, the right density, the right length of bristles. I use it for just standard, no-fuss, application of liquid foundations, but I find these types of brushes work better with thicker liquid formulations (for example, it's not great with something thinner like MAC Face & Body or a tinted moisturiser). The MAC 191 is also a good standard brush, it also works nicely for cream-based contours and for both face and body product application. Louise Young LY02 Foundation Taklon - this is a huge, rounded, flat brush with synthetic bristles. This fights the MAC 190 for the position of The Best Flat Brush that I own, especially for super-fast application of a liquid foundation. I like to use this to "pat" liquid foundation onto my face. Real Techniques Pointed Foundation brush (Core Collection set) - this sounds like it belongs under the Pointed Foundation section, but it's actually a flat/paddle type foundation brush. It has synthetic bristles. This is a very small brush so is great for smaller faces, for reaching areas like the nose and ears, and also for concealer, but it's not a brush I reach for on a very regular basis. I also use it to apply Kett foundation along with my Real Techniques Buffing brush (see below for more details). The Real Techniques Essential Foundation brush (Travel Essentials set) is a thicker paddle type brush (but nowhere near as thick as the Coco Beau brush mentioned below). Like all the other Real Techniques brushes, it's got silky soft synthetic bristles which hold their shape, wear well, wash well, do their job well. I don't use it very often but that's mainly because if I'm reaching for a standard flat foundation brush, I tend to favour my MAC 190 brush. All of the Real Techniques brushes are highly recommended. Crown C108 Flat Bronzer. This has sable fibres and is a flat-topped round brush. It is designed for application of bronzer/face powder, however I also use it for application of mineral foundations, using circular buffing motions into the skin. 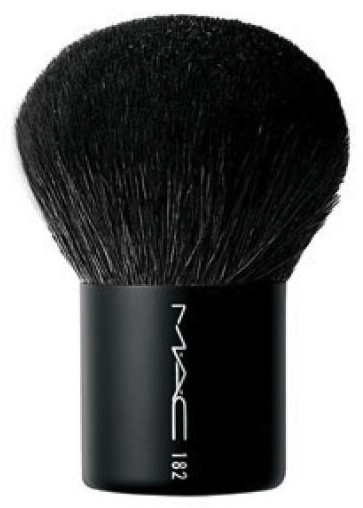 The MAC 182 Buffer brush has goats hair and is a soft but reasonably dense brush, great for buffing powder products into your face and giving your face that final "polish". I sometimes use it for blending out MAC Mineralise Skinfinish if I've used it as a foundation (on its own or over MAC Face & Body for example). aDesign Flat-top Kabuki. A synthetic bristle, flat-topped round brush. I use this for buffing powder-to-cream foundations into my skin, but I rarely use it as I generally tend to favour a puff/sponge for this type of foundation. However it is very soft and does the trick nicely and quite quickly. Real Techniques Buffing brush (Core Collection) and Real Techniques Pointed Foundation (see above). These both have synthetic bristles. This former is the best buffing brush I own. It has a very slightly rounded, not completely flat, head. I use it for mineral foundations, and for buffing in heavier, creamy foundations. I also use the buffing brush along with the Pointed Foundation brush to apply thicker cream-based foundations (eg my Kett Fixx Crème foundation - I use the pointed foundation brush to apply the cream to my face, and use the buffing brush to blend it in. 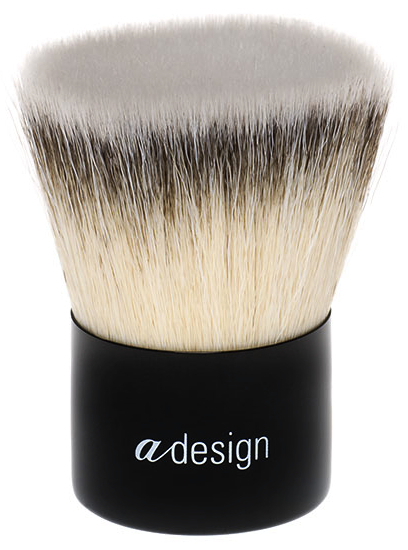 aDesign Pointed Foundation Kabuki has synthetic fibres and a pointed tip. I love the idea behind this brush but personally, the combination of the pointed fibres together with the short handle just doesn't 100% work for me. It's a beautiful brush however, the fibres are synthetic and very soft, and it makes short work of a fast application of liquid products, or for blending or buffing cream-based foundations into the skin. Stila Brush #33. This has synthetic fibres and a pointed tip, is quite a firm brush, good for blending liquid or cream foundations, but I rarely reach for it, except as a travel brush as it has two different brushes in either end (a pointed foundation brush and pointed concealer brush). It's a very firm brush but a little small so better for smaller faces. The point does help it to get in around the nose and ears. MAC 187 Duo Fibre Brush. This was the first dual fibre/skunk/stippling brush I ever bought. The first dual fibre brush, as far as I know, that was ever produced by anyone. It's one of the best dual fibre brushes available. I use it mostly for liquid foundation, finishing off the face to put a polish on it after a flat foundation brush is used to apply the foundation. This gets rid of streak marks, gives the foundation a final, flawless, airbrushed, polished finish. MAC 188 Small Duo Fibre brush. This is a smaller version of the 187 - I use it in my kit bag for applying foundation to smaller faces, and also for application of blusher (cream and powder) and as an "eraser" for makeup mistakes. 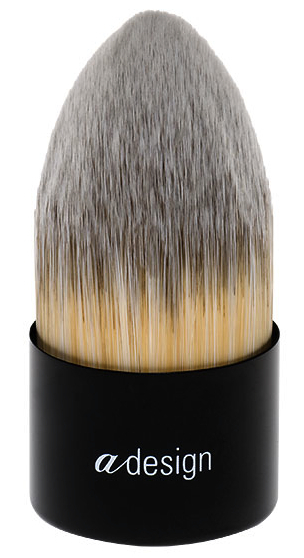 Laura Mercier Finishing Brush - a brush with dual fibres of both goats hair and synthetic hair. Like all similar brushes, some of the bristles (the goats hair) are meant to pick up product and deposit it onto the skin, whereas the synthetic bristles are designed to buff/even out the product on the skin. Also, like most dual fibre brushes, it can be used for liquid or powder products, and when used for foundation, gives a flawless finish. You can use it as a stippling brush or as a buffing brush. This one has a slight edge over my MAC 187 brush, as I feel it doesn't splay as much over time as the MAC brush tends to. Coco Beau's The Big Fat Firm Foundation brush has a blend of synthetic fibres and is a rounded top paddle brush, but is a very thick, chunky, foundation brush; a bit of a cross between the Crown buffing brush above and a flat paddle brush, with a rounded top but not a pointed tip. This makes super-fast work of applying cream/liquid foundations in a hurry. It's soft and feels nice on your face. The company are an absolute pleasure to deal with, and have a very personal and personable approach to sales, although you can only purchase directly from their site for the time being. Louise Young LY34 Super Foundation brush. This has synthetic bristles and a rounded top (note that the top isn't quite as pointed a tip as the picture on the site suggests). This has been featured by many bloggers and on Channel4.com/beauty and it really is a great application tool for more creamy liquid formulations. It also works well for compact powder-to-foundation formulations, but what I pretty much solely use it for is the Chanel Soleil Tan de Chanel* (bronzing makeup base) - for which this brush was MADE, as far as I'm concerned. * Incidentally, this is without a doubt the best bronzer on the planet - it has no shimmer, no glitter; it manages to work with every skin type (young and old, combination, oily or dry), every tone (pink, yellow and neutral) and every shade (from uber-pale to medium) that I've come across. It's not cheap, but it gives a beautiful natural flush of radiance right up to a more bronzed glow, depending on how much you build it up. Makeup Blending Sponge. Clearly, this is not a brush!!! This is a latex-free sponge. Wet it thoroughly and then squeeze it out, "Bounce" foundation onto your face (using the flatter end) to give a flawless, seemless, makeup application. The pointed end is good for getting foundation into smaller cracks (eg around the nose and ears). This needs to be washed after every use, however, as otherwise bacteria can build up. I have a handful of these and I generally use a new one every day then wash a bunch of them together. This was purchased by me after a very favourable review by GossMakeupArtist - I think it's absolutely brilliant. I also use standard triangular (latex) sponges for foundation (also wetted down), these are also good but I prefer the makeup blending sponge. Other than all of those above, I have a bunch of other brushes (flat and dual fibre) from Crown, Sigma, The Conservatorie which are also great but just standard work-horse brushes that I use in classes, so I am not going to specifically mention them here. For liquid-based foundation, swirl a clean/dry brush first in a tiny bit of moisturiser or primer before the foundation; this helps avoid soaking up too much product in the bristles (you don't need to do this when you already have product on the brush). Don't leave it too long in between each wash. As foundation is generally liquid-based, and as the bristles generally tend to be reasonably densely packed, bacteria can build up. I generally wash my foundation brushes every week (but then I may have only used each brush once or twice in that week). I wash my sponges after each use. For powder-based foundations, you can get away with a couple more uses before having to wash them, but I still don't recommend more than a dozen uses before washing them. In general, synthetic brushes work better for liquid/cream based products, and natural fibres for powder/mineral products. 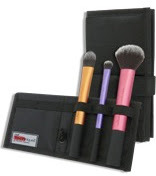 However, densely packed flat-top synthetic brushes work for powder as well as liquid products. Paddle brushes work well for creamier liquid foundations. Buffing brushes work well for all liquid foundations from lightweight, water-based, thinner formulations right up to heavy waxy formulations. 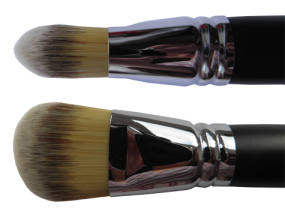 Flat-topped buffing brushes work best for mineral foundation, powder foundation and powder-to-compact foundation. 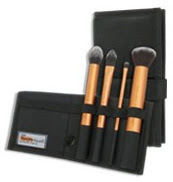 Dual fibre brushes, sometimes called stippling brushes or skunk brushes, can be used for liquid foundation, for finishing the face, for powder foundations, for blush (powder, mineral, cream), for correcting makeup mistakes, for buffing product into the skin, for stippling product into the skin. Entirely my opinion, but I think sponges (in particular the one mentioned above) give the most flawless finish for all liquid-based foundations.